Route 66 is known for its neon attractions. Nob Hill, being a historic part of Route 66, is no exception. With original architecture and signage inspired by the Mother Road’s distinctive era lining up and down along Central Ave, Nob Hill’s Main Street boasts original neon signs and roadside attractions, and even has a retail shop devoted to selling neon art and signage. Along with the classic architecture found along the Mother Road, today Nob Hill features installations that represent the attractive style of this nostalgic time in America’s history. While driving up and down Central Avenue, have you ever noticed the large arches that hang across the Eastern and Western ends of Nob Hill’s corridor at Washington and Girard? In the daytime they stand high above the traffic on Central Ave., signaling you’ve arrived or are departing Nob Hill. At night, the bright glow of these beautiful neon lights accentuate the shape of the arches making them hard to overlook. 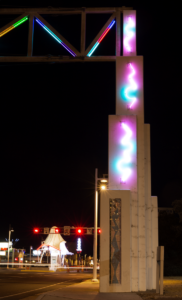 These large neon sculptures remind locals and travelers alike of Central Avenue’s historic ties to Route 66. However, these gateway arches were not constructed during Route 66’s heydays in the 50’s, but over 40 years later- 1993 to be exact. 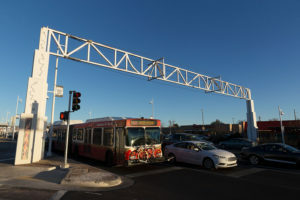 Created by artists Terry Conrad and Joan Weissman, the Nob Hill gateways were a public art project created in collaboration with Albuquerque’s Public Art Urban Enhancement Program. “The program developed projects that played on the Route 66-era commercial signs,” stated Mark Childs and Ellen Babcock in the book Zeon Files: Art and Design of Historic Route 66 Signs. These gateway arches are a symbol to the modern forces that shaped the landscape of Central Ave. in Nob Hill. 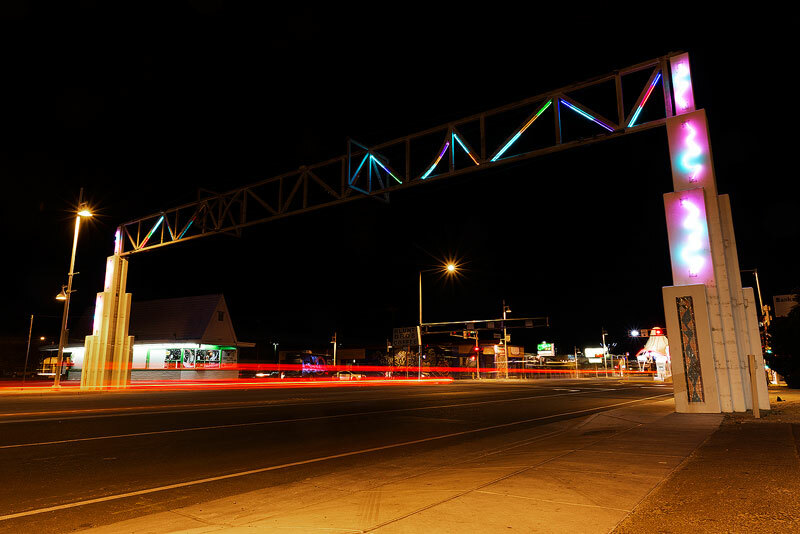 Standing tall for 25 years, the neon lights don’t shine as bright as they used to, but one can’t help but to admire these structures and be transported to an era where New Mexicans and the rest of America adventurously hit the road in search of new experiences. If you want to learn more about Nob Hill’s unique story, check out our History and Oral History Documentary sections!